The EndoLIF® O(Oblique)-Cage has been introduced to offer a minimally invasive as well as open (PLIF/ TLIF) alternative for fusion in the lumbar spine as an optimal treatment option for surgeons. The endoscopic access is based on the proven TESSYS® access system, however application is also possible without having used the TESSYS® method before. This access offers the possibility of tissue conservation and dilation of the soft tissue between the muscle fibers with the use of special dilators. The dilators are then replaced with the working tube which fixates itself onto the vertebral body and into the surrounding muscle tissue through its unique design. Preparation of vertebral disc space and implantation of the EndoLIF® O-Cage is achieved with endoscopic assistance through the working tube, without the need to remove dorsal bone structures. Therefore, a fusion can be achieved without permanent structural damage to the bone or the multifidus muscle, which is vital for spinal stability1. The EndoLIF® O-Cage consists of a titanium alloy (Ti6Al4V) which is produced through the EBM (Electron Beam Melting) method. The porous surface is an optimal base for cell proliferation and bone growth. The diamond cell structure of the implant provides an increased surface area. This surface-enlarging effect helps stimulate cell growth and may lead to a quicker fusion rate. Due to the special implant design, it is possible to verify bone fusion progress by X-ray or CT imaging. The Oblique-Cage is available in 2 length (30 and 35 mm) and with 1 mm increases in the height of 8 to 14 mm and is fillable with autologous bone or bone substitute. Titanium and titanium alloys are well known for their excellent biocompatibility and affinity to the surrounding bone. Compared to other implant materials, such as recent studies show2, especially the incorporation behavior of Ti6Al4V ELI alloy (ELI = Extra Low Interstitials) is highly osteointegrative. This porous titanium alloy is produced in an EBM process, has further improved mechanical properties in comparison with pure titanium and is ideally suited for application and preparation of spine cages3,4, as demonstrated with the joimax® EndoLIF® cages. The Ti6Al4V ELI alloy used for the EndoLIF® O-Cage is of special purity. The incorporation of foreign atoms, as iron and oxygen are carefully observed (according to ISO 5832-3) to improve the ductility (plastic deformation) and increase the break strength. In addition to extensive biomechanical tests and FEM analyses the cage design has been optimized and adapted to the anatomical conditions. 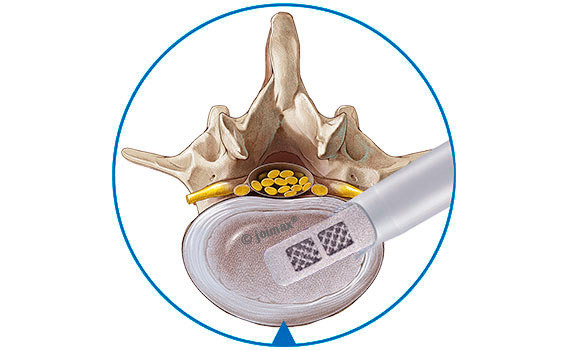 The numerous product advantages thus add up to an ideal cage implant for vertebral body fusion. 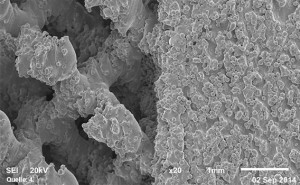 Micrograph (left) illustrating solid and porous structure produced using the EBM technique in monolithic form. 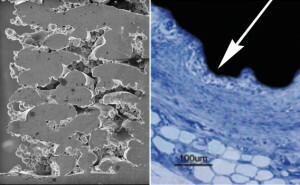 Right: Light optical micrographs of the implants showing fibrous encapsulation (see arrow)3,4. 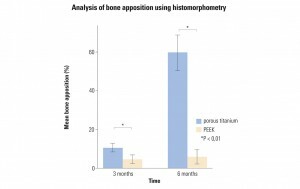 Bone apposition analysis using histomorphometry. Bone apposition was measured as the percentage of intimate bone material contact. Bone apposition of porous titanium cage increased over time and was significantly higher than that of PEEK cages throughout the study2. 1Choll W. Kim et al. : The Current State of Minimally Invasive Spine Surgery In: The Journal of Bone & Joint Surgery Volume 93-A, Number 6, 2011;93:582-596.